Taxes this year are due on Monday, April 15th. We know a lot of you may be working late the weekend before to get them all done and in on time. We appreciate that. So after you’ve finished carrying the one and referencing table A on document 1086, we think you should reward yourself with a little shimmy, some bump and grind, and some of Seattle’s amazing burlesque performers. We’ll even start later for you. On Saturday, April 13th, we'll be staying late for Sunday's Early Edition of the Belltown Burlesque Revue. Some may call it a late show, starting at 11:00 pm and doors opening at 10:30 pm, we consider this the extra early Sunday Morning Edition. Either way, it'll be an amazing way to enter into the new week. The raucous Lilith von Fraumench will be your host and guide through the evening. The Belltown Burlesque Revue: The Really Early Sunday Edition is April 11th at the Re-Bar located at the east end of Seattle's historic Belltown neighborhood. You can RSVP for the show and share it with your friends on Facebook! $50 for V.I.P. seat in the front row and a good bag to go with it. It Came From The Backstage Door! Monsters, space aliens, and peril! Oh my! Purple Devil Productions presents an evening of fun, just looking back to the golden age of cinema where atomic horrors, diabolical plans from outer space, and home grown terrors greeted us with our demise on a silver platter. 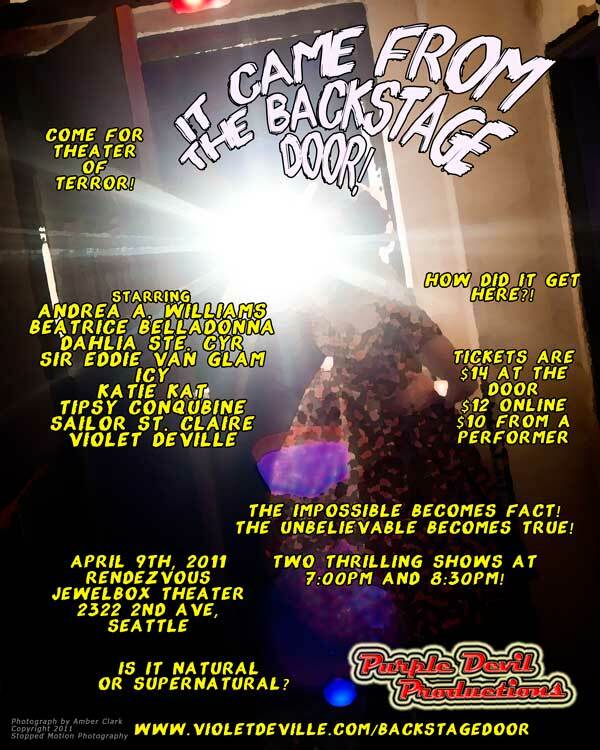 Please join us for an evening of burlesque, belly dance, and a horrifyingly good time! Is it natural or SUPERNATURAL? Two thrilling shows at 7:00pm and 8:30pm!